"This is a quick and easy recipe that tastes delicious. 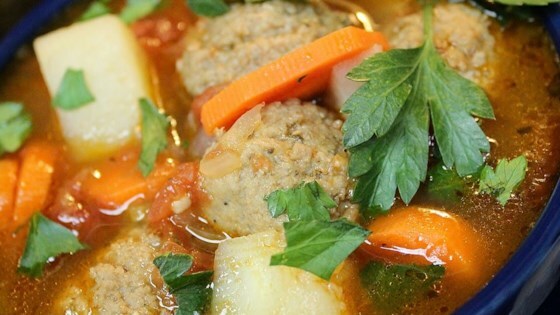 Carrots and potatoes, with salsa and meatballs, makes for a hearty, delicious soup that can be prepared in no time at all." In a large stock pot, bring water, carrots, potatoes, onion, salsa, and bouillon cubes to a boil. Reduce to a medium simmer, stirring occasionally, approximately 10 minutes. Mix the beef, breadcrumbs, and milk together in a bowl. Form into 1-inch meatballs, and drop into boiling broth. Once soup returns to a boil, reduce heat to medium-low. Cover and cook 20 minutes, or until meatballs are no longer pink in center and vegetables are tender. Serve with sprinkled cilantro for garnish. Good, authentic-tasting recipe. Added some canned corn kernels I had on hand but otherwise followed the instructions to a t: very easy! For people on restricted salt diets, use low sodium beef broth instead. The flavor will be great. Use lean meat to reduce the fat content.